I like mechs as much as the next guy, and since I’m alone in my office, I am the next guy, and I like mechs quite a lot. 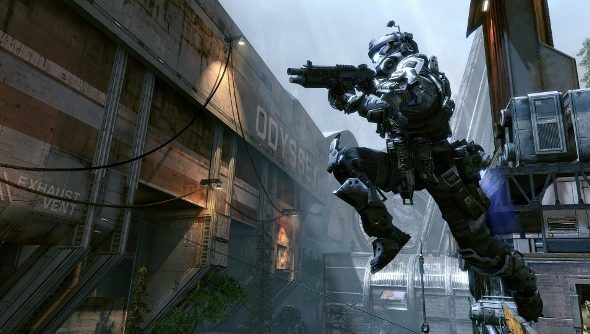 But when it comes to Titanfall, I’m less a fan of the mechs than I am the pilots who… pilot them; specifically when they are doing things other than piloting their Titans. Titanfall update six is for people like me then, amazing people. It introduces a new game mode: Pilot Skirmish, which strips out AI troops and Titans, leaving two teams of eight pilots to duke it out alone. Maybe it defeats the purpose of Titanfall, a game about mechs doing stuff with other mechs, but the free moving pilots with their wall running and nifty weapons felt like a much greater revelation than their lumbering machines, so it only seems fair that they get their time in the spotlight. The smaller team size means that Pilot Skirmish won’t be in the Variety Pack playlist. If the thought of the Titans being put out to pasture is upsetting, then fret not. This sixth update also makes the Marked For Death mode a permanent feature. It was introduced in update four, turning a player on each team into a target, and it’s popularity has led Respawn to keep it around instead of rotating it. Marked For Death’s tenure means that it gets a playlist and custom Marked For Death loadouts can be unlocked.